As a mobile phone users, your device certainly contains a lot of personal information phone numbers, text messages, pictures, and, depending on what types of apps you use. If you're thinking of selling or trading your old iDevice, , you probably know that you'll need to wipe your device before next owner get it. But , how to wipe iPhone, iPad or iPod clean is always a Herculean task for so many software and programs. You know, prior to marketing your iPhone, iPad or iPod device, it is expedient to make sure all the data are totally wiped out or cleaned. This is because when planning to market your device, you do not know who will purchase it. So, you must make sure that you properly wipe your iDevice before getting rid of it to protect your private information. 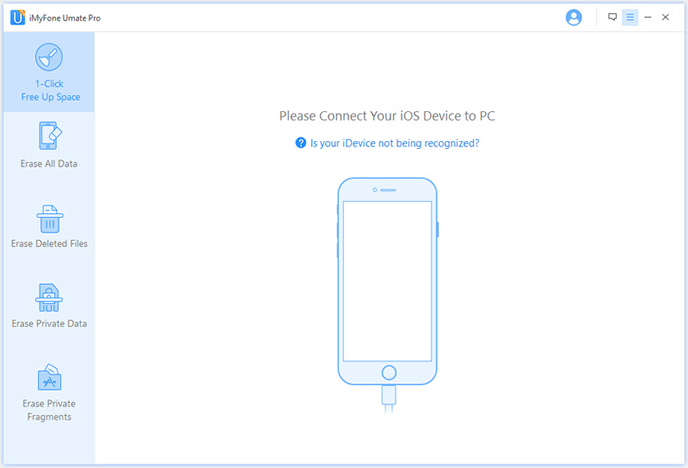 Here, there are two methods for your reference: Factory reset and iOS Data eraser application. 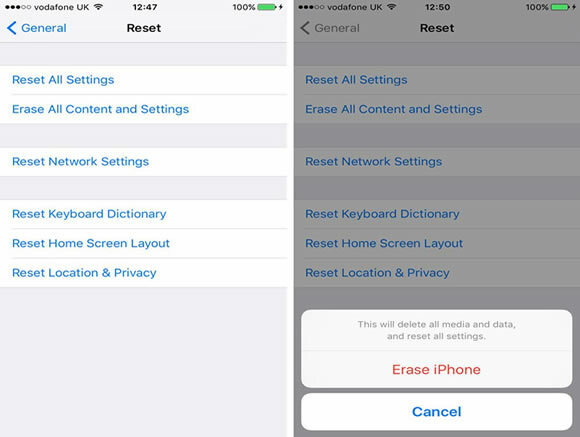 Part 1: Remove Data from iDevice by Performing "Factory Reset"
Not only the "Factory Reset" feature cloud help users solve the issues for iPhone, iPad or iPod when it was crashed, freezing or stuck in recovery mode, but also allows you to clean content on your iDevice. To start, make sure you've backed up your important data you want to keep, then follow the steps below to restore your device to factory settings. Step 1: Turn on your idevice, go to Settings and tap General > Reset > Erase All Content and Settings. Step 3: You will be prompted to type your iPhone's passcode, then tap Erase. Maybe most Apple users think the data can be permanently removed by hitting a "reset” or "delete" button in the iPhone's settings menu, this is really not far enough to prevent strangers from recovering your personal information with professional iOS Data recovery programs, in fact, some data was not really gone and still remain or behind of your storage system. Over the past few years, data-storage technology has become more complex due to the new security needs, including wallet, passcode, activation Lock, Apple Pay and more, it means that simple deletion or reset will not far enough to make your data completely wiped from your device. Can the whole data be erased completely? The answer remains yes. Is there a tested and proven method for iPhone users to get rid of stored information? The response is also yes. For the process to be effectively done you need software or data erasing tool to get a reliable result. This is where Safewiper principle and solution software comes into play - Safewiper iPhone Data Eraser. 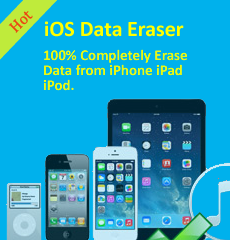 Deeply scan and erase traces of deleted files from iDevice completely. Wipe your iOS device and settings, ensure deleted and existing data is unrecoverable any more. First of all, you need to download the program on your computer, windows and Mac version are now available, then run it after installation. Meanwhile connect your iDevice to computer via USB cable. When the program recognizes your device, you'll see its main window as follows. In the latest updates, the program added many new features. It has now five erasing modes for your choice, “Photos Compressor”, "EXPRESS CLEANUP", "ERASE PRIVATE Data", "ERASE DELETED FILES" and "ERASE ALL DATA". If you want to wipe your iPhone or iPad clean. We suggest you to choose 'Erase all data', this action will PERMANENTLY erase all data and can NOT be undo. 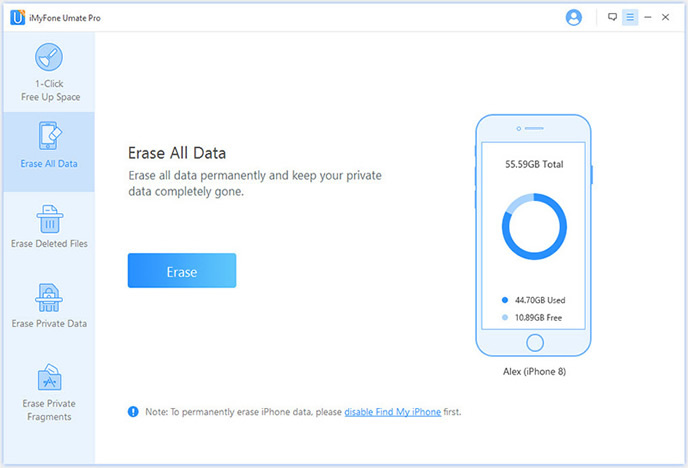 With Safewiper iPhone Data Eraser , your personal privacy will not be endangered in any way, this is because the system is specially designed to help you clear or wipe out every trace of data and other information on iPhone. You can give Safewiper software a try now to discover how it works. Your iDevice will become totally new from inside after following all the steps above. With this simple and easy idea, you can market your phone without any data remaining in it. Safewiper principle is best that you can ever find in the market today.